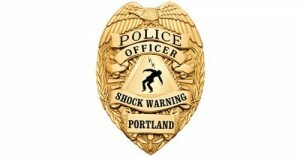 Portland Police are using their Tasers almost twice 26 percent more against people with mental illness as they were in 2006 according to a new report. A use of force report released by the city in November 2006 showed only 26% of force used against people with mental illness was Taser use, but a new use of force released yesterday puts that statistic at 52%. There were 110 Taser uses against people suffering with mental illness in the most current reporting reporting period, November 2007 to November 2008, and in a previous 12-month period between October 05-September 06 there were 87 uses of Tasers against people suffering with mental illness. The report said understanding those fluctuations would be beyond its scope. You can download the whole thing here. That data has mental health advocates concerned. The police bureau introduced new Crisis Intervention Training for its officers in dealing with people suffering from mental illness following the death in police custody of James Chasse, a man suffering from schizophrenia, in 2006. But while the bureau says it has now trained all its officers, mental health advocates are concerned that there is no way to measure the success of that training. Numbers released last year also showed cops using a disproportionate amount of force against African Americans—a trend that continues in the latest report. 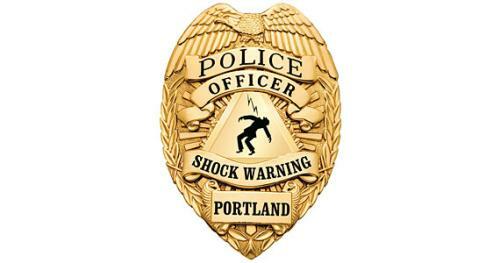 You can read the Portland Mercury article about Taser use here in Portland written last November by clicking here. 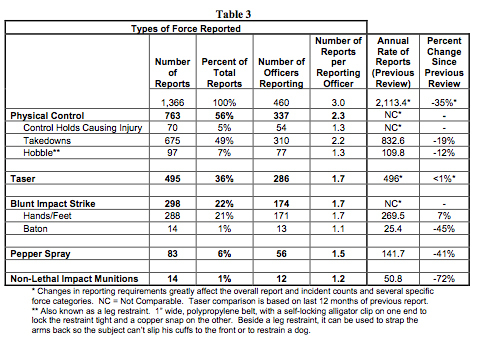 Complaints about uses of force are down 58% since 2004, from 118 to 50. A police bureau spokesperson is yet to return a call for comment, but Police Chief Rosie Sizer is scheduled to present the report to the city’s Citizen Review Committee this afternoon at 5:30, at city hall. Hopefully the chief will announce plans to probe this issue further. Handelman would like to see more research done into the reasons behind the increase. Handelman is also extremely concerned about police apparently using the Taser as a compliance tool. Tasers were used 61 times against people who “failed to comply,” and 18 times where no resistance was indicated on the use of force form.